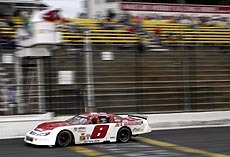 Johnny Clark is fresh off a championship season in PASS Pro Stocks (Super Late Models) and he is widely acknowledged as being one of the young stars of short track racing, but a racer has to have his goals for the futrue right? When Clark’s PASS season allows him too, Clark will head back to Concord for another shot at the master. So far, he’s made pretty steady progress. 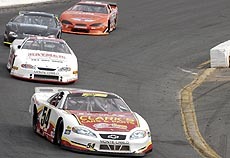 There have been a lot of drivers, from Charlie Bradberry to Ted Christopher, who have gone on record with the goal of beating Query. But in talking with Clark, you realize that his comments aren’t about trash talking, but rather setting the goal of going head-to-head with a guy that he respects and being able to see if he can be just a little bit better. Clark had a strong run at Concord in the fall. The relationship that Clark has with Query goes back a few years. Clark looks forward to any chance that he'll get to go back to North Carolina and race. One thing that Clark really hopes is that the rumors that he has heard about a track reconfiguration aren’t true. Because of Clark's PASS title defense he probably won't be returning to Concord until this fall. When Speed51.com recently caught up with Clark at the track, he was open about the things that he would like to accomplish in racing. More PASS victories and a win in the Banknorth 250 are on top of that list, but there is another thing that sticks out in Clark’s mind. That is a trip down south to beat one of the best short trackers in the country, Freddie Query, on his home turf of Concord Motorsport Park. 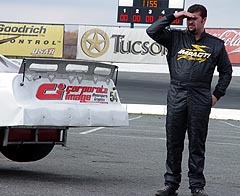 The rivalry heated up last season when Clark went down to Concord and finished second to Query in the Asphalt World Championships, a late-season open show at the track.